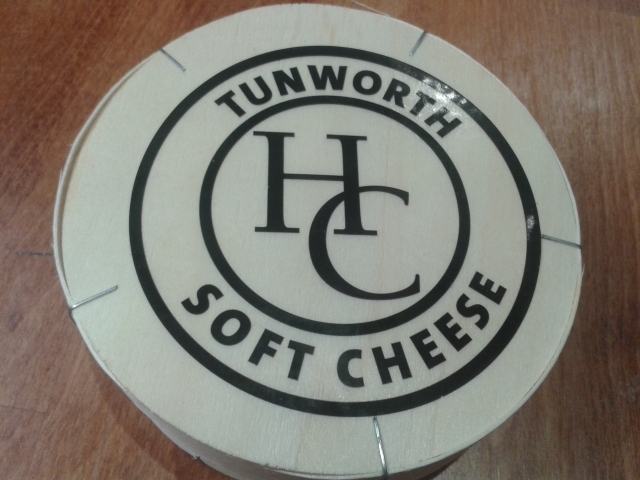 Tunworth was a name that I’d heard time and time again since I started my cheese journey. Everyone raves about it, with Raymond Blanc calling it ‘the best Camembert in the world’ (which I imagine made him a whole lot of fromage friends back in his native France.) It was definitely on my hit-list and so I was really pleased when I won some in the La Cremerie recipe competition that I talked about on a previous thread. It’s an exciting moment when you open the door to see postie with a box but I must admit that my first thought on encountering this postie was ‘Whoah, my love, you need to have a bit of a washdown.’ But I smiled nicely, signed the chit, closed the door and realised that the smell was actually coming from the box, not the poor postman. That makes it sound bad, I realise, but that’s the beauty of cheese, isn’t it? Cabbagey-smelling postman = bad. Cabbagey-smelling cheese = very good. Tunworth is a soft mould-ripened cheese made with pasteurised cow’s milk by Stacey Hedges and Charlotte Spruce of Hampshire Cheeses (Julie Cheyney was one of the original founders but has since struck out on her own to make St Jude, which I talked about last week). The Company was founded in 2005 when Hedges and Cheyney, who had met at the school gates, decided to make cheese together and carried out some research as to what was missing in the British cheese market. Advised by no less than Randolph Hodgson, the founder of Neal’s Yard Dairy that no-one was making a good, soft white cheese like a Brie or Camembert, they went back to their kitchens and started experimenting. They were aiming for a thin, crinkly edible rind with an unctuous centre. Eighteen months later and Hodgson cut into their prototype, tasted it and promptly put in an order. Shortly afterwards the cheese gongs started pouring in and the team now work from a purpose-built dairy. Their milk is sourced from a local herd of Holsteins and they use about 2,500 litres of milk every day – which yields a staggering 800 Tunworths. It’s the milk that makes the cheese so creamy but what the cows are eating is vital to its taste. As with all milk, it will vary according the seasons, weather and even humidity. Feeding them maize silage is apparently a bad idea as it taints the milk! And the taste? 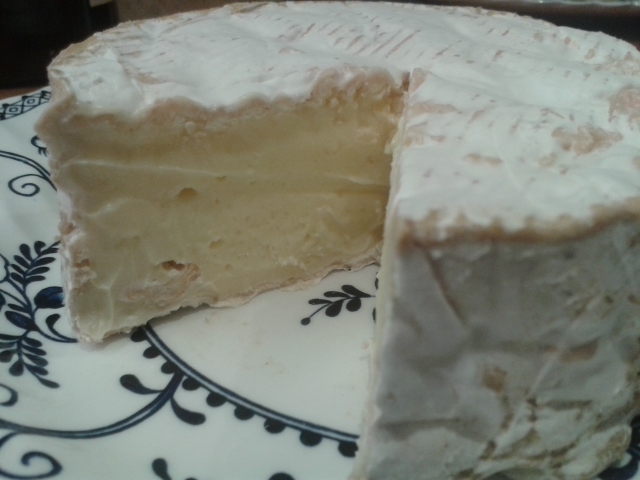 Well, if you’re a fan of Brie or Camembert, it’s one to seek out. It’s the kind of cheese that you may as well as scoop out with a spoon rather than bother with a knife, it’s so soft and creamy. The rind gives way to the paste so easily that you just eat the lot together rather than bothering to sliver off the rind (if you’re the sort who normally does that). The taste is not what I’d call subtle; there’s a punch of mushroom and cabbage and a slight bitterness that just catches the back of the throat for an instant before the creamy paste swooshes it away. It is delicious though, there’s no doubt about that. I’ve also heard tell that it’s delicious baked but my wheel has already been half-gobbled…next time. Additional research from: Farmers Guardian, The Telegraph and The Foodie Bugle. Smoked cheese, bad knitwear – and a chance to use my tin box smoker – nuts to the 5:2 diet. Mmm, Camenbert is one of my favourite cheese–I’ll definitely have to give this one a try someday!